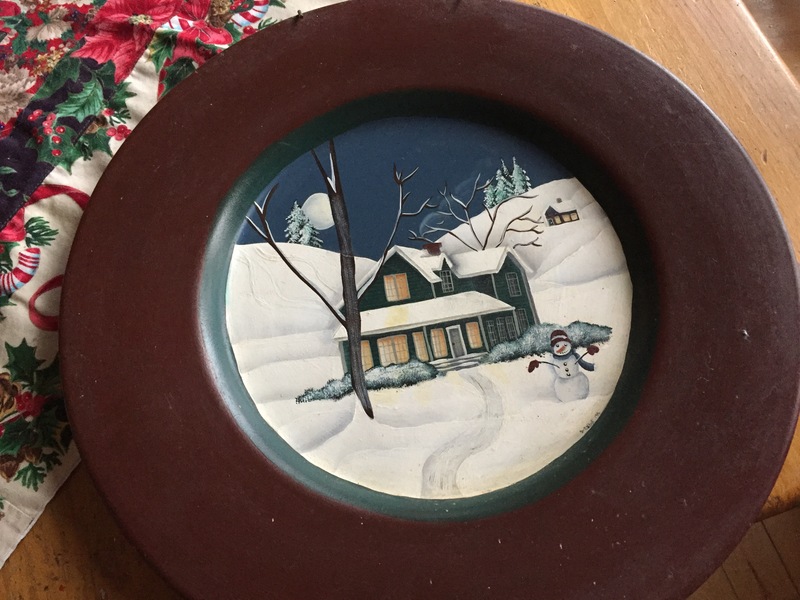 It’s legendary in our household–the tale of the tole-painted plate. Years ago, when Dave and I were first dating, I had taken a folk art painting course. I was terrible at it, but my instructor was very talented and at the end of the course I bought a beautiful tole-painted plate of a wintry scene. It was December and because I felt so guilty spending money on myself before Christmas, I wrapped up the plate, wrote “To Dave” on the tag and tucked it under the tree. To this day, I still hear about it, but somehow all three of us–Dave, me and the plate have survived 27 years of marriage. I think he secretly cherishes the tole-painted plate. He says every time he looks at it he thinks what a lame gift it was and that I’m psychologically scarred because I can’t just buy something for myself and feel good about it. My response is at least I don’t buy ice fishing huts and gear and hide them in the barn from my wife. This week’s #HappyAct is when you’re out frantically finding that perfect last minute gift for the someone special on your list, buy a little something for yourself. I do have one little problem this year though. The thing I bought for myself I can’t exactly write “To Dave” on the tag. Guess I’ll have to give it to myself from Bella. Dogs are very good shoppers after all. Ha ha, on our first Christmas together in our house in 1994 I bought a certain un-named person a decorative plate for Christmas because it was the same style as his grandma’s teapot that he admired over and over. Well, he was bewildered about why I bought him that plate and then I was confused because I honestly thought it was a good present and then I was kind of embarrassed when he told everyone and they looked at me like I was weird. I can kind of laugh about it now but I still think it was a good present! Thanks for sharing your story of the plate that I have seen at your house countless times. One christmas Michael Carlevale presented me with a blue velvet hatbox with an enourmous bow on it. I was so overwhelmed by the thought of the Bowler hat that I was sure was inside. Michael was a resturantuer and food was everything to him. It was at a time when there were many occasions that a Bowler would have been the ideal accessory. Finally from under the tree came the beautiful blue velvet hatbox and with delicate anticipation I opened it up and out emerged the most extravagant Panetone I had ever seen. It took a long time for me to understand how much the special Italian cake meant to Michael to give it as a gift and I cherish every mouthful when I eat a piece of Panetone now. What a wonderful story, thanks for sharing David!